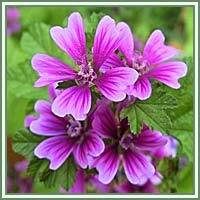 Habitat: Mallow can be found in gardens, lawns, roadsides, waste areas and barnyards. It is native to Europe, northern Africa and Asia. Description: Mallow is an annual to biennial plant. It can reach 60 to 120 centimeters in height. Its stem is round and thick. Leaves are deep green, heart-shaped with 3 to 7 lobes. They have fine hairs on their underside. Flowers are pink to purple, five-petaled, striped with dark veins. Mallow usually flowers the whole summer and during early fall. Parts used: Root, leaves, flowers. Useful components: Mucilage, tannins, volatile oil. 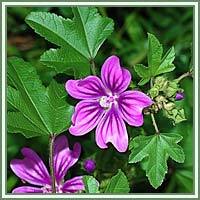 Medicinal use: Mallow has anti-inflammatory, astringent,laxative and diuretic properties. In traditional Native American medicine, Mallow was used in cases of sores, different kinds of swellings, broken bones, painful stomach congestions and injuries. Today, Mallow is considered to be helpful in cases of irritations produced by dry coughs, forming protective layers on the inflamed mucous membranes. It alleviates inflammations and mouth irritations. It is very useful in treatment of different sorts of respiratory complaints. It can also be useful in treatment of gastroenteritis and constipation. Tea made from the root acts as a very good diuretic. Safety: Some herbs could react with certain medication. Therefore it is advisable to contact your doctor/herbalist before consumption of any herb.